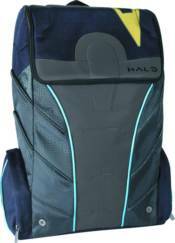 Halo fans can carry their books, papers, and gear in this new Spartan Locke Backpack! Inspired by SPARTAN Locke's armor, this bag has durable padded and curved straps, comfort shaped back padding, and an ONI patch on straps. Its padded interior pocket fits up to a 15' laptop. Plus, the bag comes with a Halo 5 REQ Pack downloadable content code.